We got to see the Weaver family again in Orlando. Aka the Weaver Believer Survival Revival. They're the RVing, singing family that our kids talk about pretty much all year long. Jimmy's married and gone now, so Steve is lead guitar and is doing great! 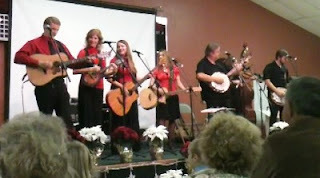 We got to hear some Christmas songs we hadn't heard before and they were very fun. Definitely in the Weaver style! Of course our favorite song is Dueling Banjos.